Aiseesoft DVD Creator provides users with the best solution to preserve any videos by burning them into DVD disc. With this amazing video to DVD Creator, users can easily convert all popular videos, like AVI, MPEG, DivX, DV, VOB, WMV, MP4, etc., to DVD-format disc, DVD folder or ISO files. Then users can enjoy the precious moments recorded by your camera on DVD player. This DVD Creator allows users to create a customized DVD menu by choosing the menu templates and inserting background picture/music. In addition, users can edit the source video effect, add audio track and subtitle to the target DVD. The intuitive interface of this DVD Creator can help customers create the wonderful DVD with a few clicks. Aiseesoft DVD Creator can convert nearly all video formats (3GP, AVI, DV, VOB, FLV, M2TS, MTS, SWF, MKV, MPG, MPEG, MPA, DAT, MP4, TS, NSV, MOV, QT, RMVB, etc.) to DVD-format disc. It supports burning videos taken by most cameras. Besides of DVD-format disc, this Video to DVD Burner allows users to burn video to DVD folder and ISO files, which can be stored in local disk. After adding the video sources, users can preview the video effect with the built-in player. During this process, users can capture the favorite scenes and save them as images. If you are not satisfied with the source video effect, this DVD Creator can help you edit the video effect, such as brightness, saturation, contrast, hue and volume. Users can also cut off any video segment and crop the video frame. This software allows users to add any text or image watermark to the video, and set its position and transparency. This software offers many beautiful menu templates for users to choose. Also you can prefer that there is no menu in your DVD. After you have chosen the menu template, you can also select the menu frame and button style. Also you can edit the menu text content and define its font, size and color. Moreover, this software enables you to attach your own background picture/music and opening film to the DVD menu. This DVD Creator allows users to choose the audio track for the DVD. Besides of the exciting audio track, you can also add your own audio track or background music to the DVD. You can choose a language to sign the audio track you preferred, adjust the volume, and choose audio encoder/bitrate/channels. If the audio track and the video scenes do not match, you can adjust the audio latency to make the audio track sync with the image of video. You can add your own subtitle to the DVD as you need. Similarly, this DVD Creator offers users the way to sign the subtitle with the language you choose, and adjust the subtitle position/font/size/color. Users can use the "Delay" function to make the subtitle sync with the audio track. 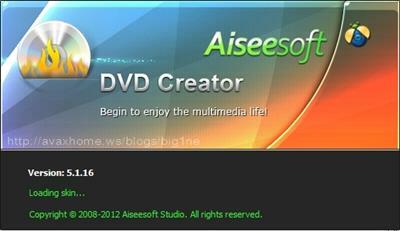 Aiseesoft DVD Creator could burn videos to nearly all DVD+-R/RW, DVD-RAM, DVD-5(4.5G) and DVD-9(8.5GB) discs. And the created DVD-format disc could be played perfect on most portable and home DVD player. Below you can post Comment about Free download Aiseesoft DVD Creator 5.2.6.Multilingual, full download Aiseesoft DVD Creator 5.2.6.Multilingual free from rapidshare, filesonic, fileserve, megaupload, mediafire, hotfile, ftp, direct download. Aiseesoft DVD Creator 5.2.6.Multilingual Torrent Download or anything related to the article here. Only English is allowed.